We have been impressed by the joining together that we have witnessed of factions of humans that we never thought we would see banding together. This is happening in the secret, but very real, arena of the alliance. There is an alliance that has been in place for quite some time, and this alliance is comprised of many different humans who hold different positions of power and who want to see a better tomorrow for the planet. Now, whenever you have humans representing different groups, different countries, and different interests, you often see that there are people who will backstab and go back on their word. We are not seeing that. Instead, we are seeing that those who are members of this alliance are coming together, even more powerfully than they were to initiate the alliance in the first place. Now, for those of you who have no idea what we are talking about, suffice it to say that there are negatively oriented extra-terrestrials out there and negatively oriented humans as well who want to dominate and destroy. And whenever you have one side of the spectrum in a system of duality, you must have the other. So the people who comprise the alliance are doing so out of a need. There is a need to have a force that counterbalances the negative side of things. But neither side is as powerful as all of you are. There are billions of you living on planet Earth, and every time you come together, every time you team up with other humans who have a similar agenda, you create such a powerful force. 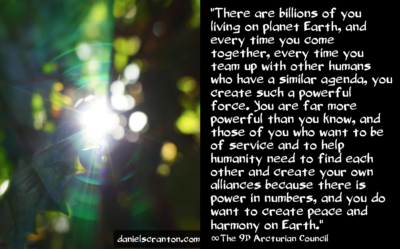 You are far more powerful than you know, and those of you who want to be of service and to help humanity need to find each other and create your own alliances because there is power in numbers, and you do want to create peace and harmony on Earth and in the galaxy. And the way to do that is not to create these alliances to push against the negatively oriented beings that are most certainly out there. But instead, you want to come together because you have a common goal of spreading more love and light to all beings in this galaxy and beyond.